Trying to save a down payment for a new home can be a major point of contention for homebuyers, especially first-time buyers. Questions always arise about how big a down payment really needs to be. The answer to that question may not be the same for every buyer, but the same general rule holds true — the more money you put towards a down payment, the lower your mortgage amount will be, and the less money you’ll pay in interest over the course of the loan. In the past, it was assumed that homebuyers would save a down payment that equaled 20% of the purchase price which enabled the financing of a home without having the additional requirement of PMI (private mortgage insurance). However, many hopeful homebuyers have found that paying a 20% down payment can be a major hurdle to home ownership. Although potential homebuyers may feel confident that they can make monthly mortgage payments and face any future home emergencies, saving a large lump sum for a down payment still proves to be a challenge for many individuals. 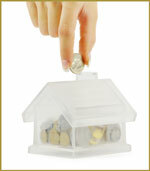 As an alternative, many mortgage options available today allow for a smaller down payment, sometimes as little as 3%. For a new home that sells for $185,000, the difference is quite remarkable. By those numbers alone, it seems like a smaller down payment is the way to go! But let’s look at what happens when you take out a loan for the same $185,000 house. On a 30-year loan with a 4.75% interest rate, you will pay $129,933 in interest over the course of your loan. On a 30-year loan with a 4.75% interest rate, you will pay $157,544 in interest over the course of your loan, in addition to the PMI you’ll need to pay due to a lower down payment. That’s nearly $30,000 you could be saving and growing over the life of your loan! A recent Harris Poll reported that among people who purchased a home in past five years, it took Millennials, on average, 3.75 years and Gen Xers 3.42 years to save their down payment. 1. Pay off credit card debt — Credit card debt is notorious for carrying higher interest rates which compound the amount you owe month after month. Take the necessary steps to pay off your debt, and once you’ve done that, continue to put that same amount of money into savings each month. 2. Use a dedicated homebuyer savings account — These accounts offer premium rates when funds are dedicated to the purpose of saving for a down payment. Diamond’s First Time Home Buyer program allows hopeful homebuyers to earn a higher interest rate on their savings for up to 24 months when the money is ultimately used to make a down payment at closing. 3. Automate your savings — Use a club account to automate a set savings amount each month. Put $100 into a club account each month and after one year, you’ll have saved $1,200 without even thinking about it. These cuts could save you $630 every month which adds up to more than $11,000 over the course of 18 months. And these are only a few short-term cutbacks. 5. Tap into your IRA — As a first-time homebuyer, you can withdraw up to $10,000 from your IRA to put towards a down payment. While you can skip the early withdrawal penalty when using this money for a down payment, you will still need to pay taxes on the withdrawal. 6. Bank any lump sums — Use your tax refund, work bonus, commission check, or monetary gifts to give your down payment savings an instant boost. 7. Take advantage of tax-free gifts — If your parents or other relatives are planning to help you save for a down payment, they can make a financial “gift” of up to $14,000 without tax repercussions for you or them. Are you ready to start saving a down payment for a new home? Review our full line of savings, money market, and share certificate options and find the best option to quickly grow your funds. Aspiring home buyers: Join us at Diamond’s next Coffee House Talk coming in September. Two dates and two locations to choose from! Visit our Calendar of Events page for more information.